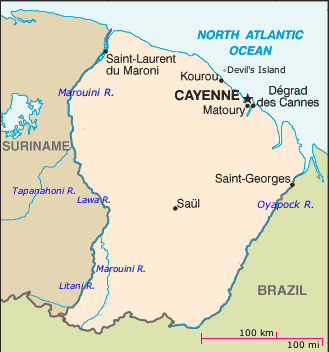 French Guiana (capital Cayenne) and neighboring states. Devil's Island was abandoned as a penal colony in 1952. French Guiana is an overseas region of France, and as part of France it is part of the European Union. its head of state is the President of the French Republic, and its head of government is the Prime Minister of France. The French Government is responsible for the area's defense and external relations. French Guiana sends two deputies to the French National Assembly and two senators to the French Senate. According to Wikipedia, politics in French Guiana is dominated by the Guianese Socialist Party. France's social security system is in force, and subsidies from Paris help the population economically. 2003: black or mulatto 66%; white 12%; East Indian, Chinese, Amerindian 12%; other 10%. Copyright © 2013 by Frank E. Smitha. All rights reserved.